Israel is characterized by a dual labor market, with high-tech and advanced industries experiencing high productivity, while a much larger share of the market is characterized by low productivity and minimal growth. The discrepancy between these two groups can be traced to opening the market to competitive imports in the early 1990s, which resulted in a polarization of the labor market. As a result, high-skilled workers have benefited from better job opportunities and higher wages, while low-skilled workers are increasingly employed in low productivity and low wage industries. To create a less polarized labor market, Israel should consider diversifying exports and creating vocational training programs. The celebration of Passover, a holiday that commemorates the duality of slavery and freedom, provides an opportunity to discuss another type of duality present in Israeli society today—Israel’s polarized labor market. In their study published in the 2015 State of the Nation Report, researchers Gilad Brand and Eitan Regev find that the business sector can be classified into two groups that differ greatly from one another. At one end of Israel’s economy are the high-tech and other advanced industries, with high and quickly rising labor productivity (labor productivity is defined as the ratio of total GDP to total work hours and is considered a useful tool for assessing a country’s economic growth and standard of living). At the other end are industries that primarily sell to the domestic market, such as most of the commerce and services sectors, and are characterized by low productivity and minimal growth. Labor market polarization is a phenomenon that has developed over the past two decades. 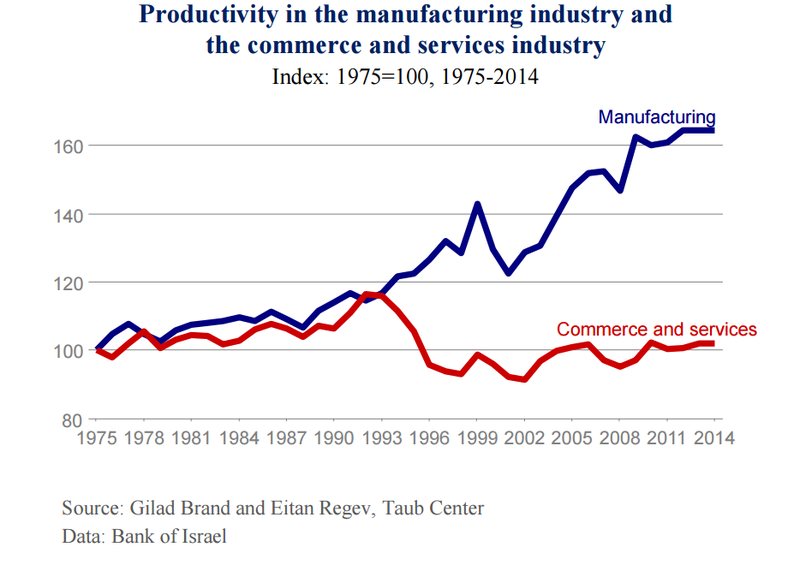 Before the early 1990s, Israel’s manufacturing and commerce and services industries had nearly identical rates of productivity growth. Yet after this point, as the Israeli economy was opened to global trade, the sectors diverged dramatically. Productivity in manufacturing shot up, while productivity in commerce and services experienced a slight decline. Not only is the rift large, but wages have also become polarized in tandem with productivity, contributing to growing income inequality in Israel. What is responsible for the polarization in Israel’s labor market and what is preventing the convergence of productivity in these two sectors? Brand and Regev find the main cause to be related to the major trade liberalization reform that took place in the Israeli market during the early nineties. It is well-known in economic literature that productivity tends to rise in industries exposed to international trade. This can explain the rise in productivity in Israel’s manufacturing industries, which are export-oriented, following trade liberalization. It is also not particularly surprising that commerce and services industries, which are locally oriented and less likely to be traded in international markets, did not see the same kind of productivity growth that occurred in manufacturing. But why did the productivity in Israel’s commerce and services industries decline in the mid-1990s? Brand and Regev find that the decline in productivity in commerce and services is explained by a transfer of low skilled workers from traditional manufacturing industries to occupations in commerce and services. Since the early 1990s, employment in traditional manufacturing industries, such as textiles, has declined whereas there was an increase in work-hours in commerce and services. 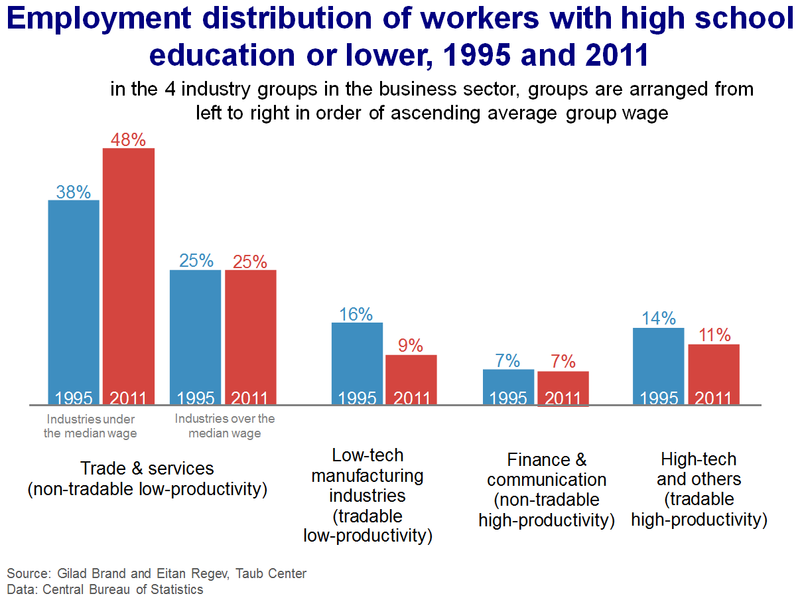 This trend is especially visible in the second figure, where we look at the employment distribution of workers with limited education: for those with a high school education or less, labor participation in low-tech manufacturing industries decreased from 16% to 9% between 1995 and 2011, while employment in commerce and services increased from 38% to 48% over the same period. An influx in supply of low paid, low skilled workers incentivizes companies to rely on cheap labor rather than investing in new technologies that would increase efficiency. As such, the use of more workers per unit of output slows down productivity. At the other end of the spectrum, opening Israel’s economy to international trade in the early 1990s has made higher skilled workers better off than they were a few decades ago by creating more opportunities in high productivity industries. Among those with a college degree, labor participation in finance, communication, and high-tech has increased since 1995. 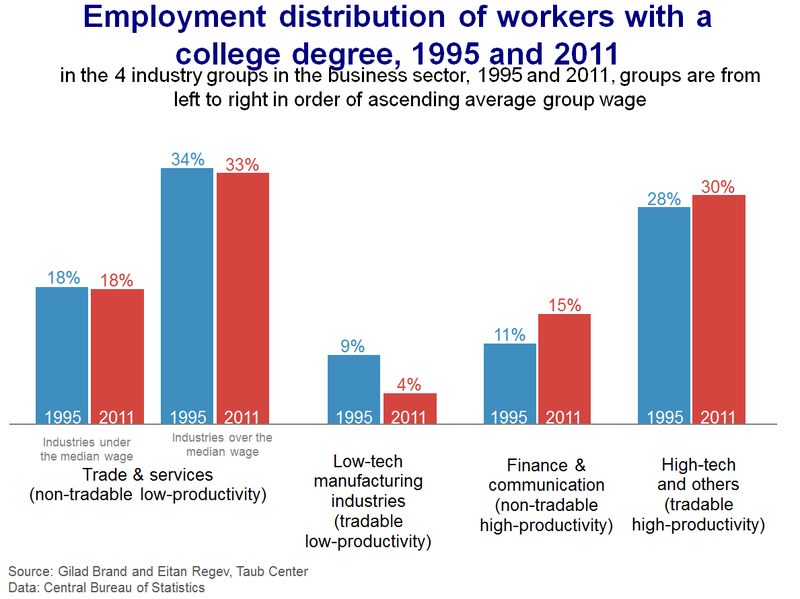 Therefore, while those with lower education and skills are moving into industries with low productivity (where their presence actually contributes to a decline in productivity), those with higher education and skills are moving into industries with higher productivity, thus increasing the productivity gap. The problem is that high-tech and other growth-oriented industries consist of a relatively small share of the workforce. The majority of workers in the business sector, about 70%, are employed in commerce and services. This means that much of the Israeli labor force is employed in industries where productivity—as well as salaries—remains relatively low. In addition to the polarization of high- and low-skilled workers, worker mobility has declined since the 1990s, stabilizing somewhat over the past decade. Even though there is an excess of low-skilled workers in commerce and services and a shortage of skilled workers in manufacturing, employees are unable to move from industry to industry because they lack the necessary skills. Brand and Regev suggest that Israel can bridge the gap between these polarized sectors by diversifying the Israeli export base and creating vocational training programs. Diversifying exports would apply pressure on wages in industries with low productivity and encourage firms in these industries to streamline their processes, ultimately leading to a narrowing of gaps within the Israeli labor market. Creating vocational training programs would also narrow the gaps by increasing occupational mobility between sectors. Increasing the supply of vocational training programs can provide an opportunity for those currently employed in low-paying jobs in commerce and services to acquire the skills necessary for integration into high productivity industries, which are in need of skilled workers and offer relatively high salaries. Also, programs like these should lead to a more efficient allocation of manpower between the manufacturing and commerce and services industries. Applying these measures would encourage more rapid and balanced economic growth in Israel and a less divided labor market.